My Dirt Road Anthem: Three Things Thursday! 1. I haven't said too much about it, but I am training for a half marathon, which is now 17 days away. Woohoo!! I am thinking that instead of doing a long run this weekend I am going to stretch it out until Tuesday, run 14 or 15 miles and then the Sunday before the race (which will be 5 days later) I will do a long run of 8 miles and call it a taper. My biggest reason for doing that is so that my runs this weekend will be shorter and will include a good tempo run and I will have more time to spend with the kids before they start school on Tuesday. I will be putting them on the bus and heading out for a run! 2. 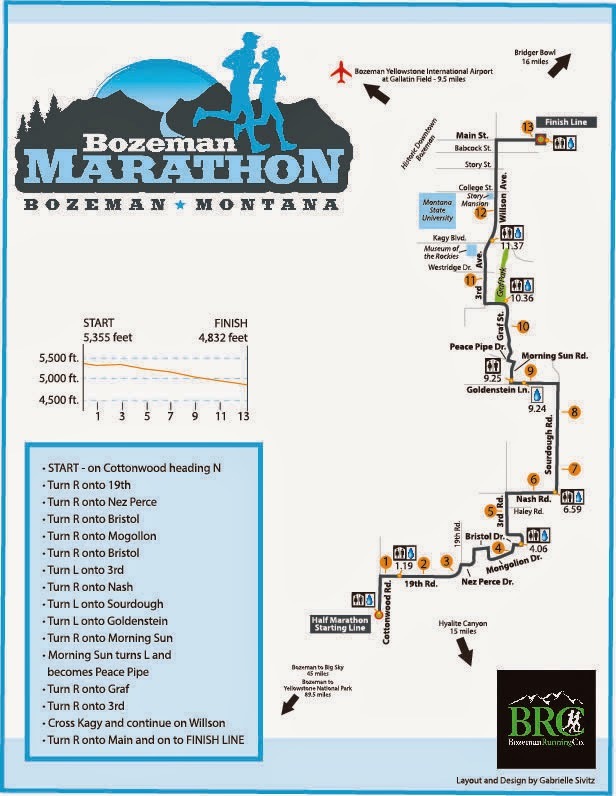 I am going to be doing the Bozeman half marathon. It will be my first time for this race so I am excited about that, but I am also excited about this, check out the elevation profile. Should be a fast race! I will be meeting a friend up there the same friend I went and ran the Missoula half marathon with. 3. Tuesday while driving my kids to a 4-H meeting on a narrow two lane road with little to no shoulder I encountered two people walking a dog, which in itself is great. My problem with them is that we were on a narrow two lane road and with the dog they were essentially three people across the road, easily halfway into the road. This meant I had to swerve around them, which would have been fine except I was cresting a hill. I could not see far into the other lane. 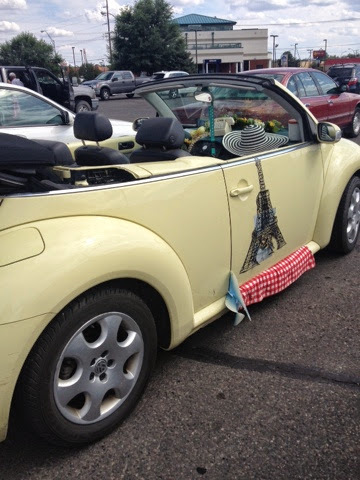 If someone else had come along they would have crashed into my car. Apparently I didn't swerve far enough around the people because the man glared at me and my children. I am sorry if I worried him, but here is my thing. I am not going to do more than I have to in order to go around them when I am putting myself and more importantly my children at risk. They should certainly have been more mindful of the situation and been walking single file once they saw me coming. As it was they made no effort to move over. I hate to say it, but had a car come along at that point, I probably would have had to swerve into the walkers to protect my children from a head on collision. What do you think of my long run plan? Love that elevation profile - should be a really nice race! Debating on a 10k in a couple weeks, and an 8k in late September; but my next big race is a half on Oct 19! I think your long run plan sounds perfect! You'll rock it, I'm sure - and that elevation should only help! Good luck! I'd probably be in the same boat with the walkers. Not safe for anyone! Sign me up for that race!! I am going to do a downhill race one of these days! That sounds awesome! People do that to me when I'm running all the time on narrow sidewalks. People in groups walking or whatever...and don't just get single file for a minute. It drives me crazy. I try to be very aware of people walking, cycling, etc on the road, but they have some responsbility too. If they saw a car they could have squished in for a minute to allow you to get by. Safer for them and you. I do not understand people who won't share the road/trail. I run into that when I'm mountain biking or running our local trail. Sadly, it seems to be older folks, walking 3-5 wide, who won't move over and then glare when I'm braking hard and trying to get around them. I would have just stayed behind them till I crested the hill. Either they would get the message that they weren't leaving you enough room to pass and move over or they wouldn't. I road bike and do my best to stay far right, but there are times where there is no shoulder and I need to take the lane to get safely up the hill. Also the first summer with my brand spanking new drivers licence, on a back dirt/gravel road I went to far in the middle of a small hill on a dirt road and ended up panicking and sideswiping a car. And it happened to be the wife of the superintendent of schools and a neighbor. We were traveling all of 30 mph at the most. Since then I get way over for fear of that happening again. Truly I understand your frustration. As a driver I am frustrated when bikers clearly can get over and walkers and runners clearly can get over. Also when runners and walkers are with traffic, when there is no sidewalk, that scares me. They can't see me, and I'd rather they see me. On the trails as Kathy is talking about when they won't give way when you give a nice loud on your left shout. Although sometimes this scares them and they scatter all over like cockroaches when the lights are turned on. All in all we ALL need to share the roads, trails, and sidewalks. Oh and that elevation profile is awesome, some sore quads but wow! Sign me up! I have family in Plains - have to look at a map to see how close the two are!! I think your training plan is good. I started a 1/2 plan that has a few 14 and 15 mile long runs in it. Kinda looking forward to how that helps my race. That race looks fun! I would've done the same thing in that driving situation. Sometimes people just don't think. That's why I hate running on our little narrow hilly country road ... it can be dangerous. Good luck on your race. You're in the final stretch! That's an awesome elevation profile! Those people sound awful, they should definitely be more mindful of not taking up the road when it's unsafe for drivers to move around them. I've always considered it my responsibility to be single file in a situation like that. I don't blame you at all, preventing your children from a head on collision is priority number one! Ugh. I'm not a fan of road users who don't understand the rules and can't be polite. I'm usually a pedestrian (city girl life) so I usually encounter the opposite problem -- drivers ignoring stop signs and crosswalks but people taking up a whole sidewalk/road/bike path also makes me nutty!